White House Plan To Provide E-Books for Poor Children Reveals Partnership Driven Future with Content as Connector. This piece was originally written for and posted on the “Houston Foresight: Preparing Professional Futurists” Blog “Student Scanning: “Empowering Youth through E-books”” This, my unedited rather verbose text, is a scanning hit, or news tidbits that indicate plausible changes in changes in the future. this post came out of a World Futures course taught by Professor Andy Hines that I took this spring at the University of Houston. Partnerships are key in a future connected by ebooks. The white house announced an initiative to provide free e-books to US children from low income families in partnership with publishers, libraries, and schools. This new plan confirms an expected future scenario that narrows equity gaps in content access. It suggests a plausible future in which content is the catalyst for meeting social needs through partnerships with technology players and our civic institutions. The White house unveiled a plan on April 30 to provide $250 million dollars worth of eBooks to the nation’s less affluent children in partnership with major publishers through an app developed in conjunction with the NY Public Library. It leverages existing technology pathways and existing partners in a new way to expand reading and learning. This is an especially impactful scanning hit because it touches upon and ties together so many STEEP categories. A true crosscut trend. Technology: app for reading this e-content developed by the NYPL with significant funding from the Institute of Museum and Library Services. Economic: provision of free content including from for profit publishers, expected economic impact of literate young citizens. Political: lead by the executive branch, driven by public agencies, supported by public libraries, in partnership with the private sector. Included content comes from the Digital Public Library of America’s publicly available content as well as around 10,000 ebooks from the following publishers: Bloomsbury, Candlewick, Cricket Media, Hachette, HarperCollins, Lee & Low, Macmillan, Penguin Random House, and Simon & Schuster. This initiative has the potential to open new impactful futures. Globally we talk about the “next billion” people to gain internet access, usually in terms of market growth. We are also addressing the next million domestically. Those in America without access to connectivity or econtent. In this partnership the libraries, the government executive branch, and publishers benefit from domestically counterposing Google and Facebook’s similar international focus in developing regions. The strongest new future element revealed is that partnerships are the driver of change. This is happening because parties came together to create a new overlap in outcomes that supports but stands independently from each of their individual goals. One interesting difference to note is the diffusion of technology development. It is the New York Public Library, not a technology partner, that produced the mobile app. It also represents a strong future for mobile applications with their new emerging role of background platform and not being the news of note itself. Co-creation. Moving futures from alternative to expected and viable requires partner driven development. We see a plausible future for public libraries in these co-creation roles. An active partner for content access and facilitator of social and economic goals. This scenario confirms the baseline of providing access to ebook content via technology partners and local Social and Political stakeholders on a more impactful level to a domestic audience. This now expected (though not yet standard) future started in large part with Facebook’s partnership early this year with ebook subscription service 24Symbols and South American mobile carriers that delivers ebook to rural poor areas through an app from Facebook’s internet.org initiative. This also represents a plausible alternative future wherein the content comes directly from publishers instead of an intermediary that negotiates a content catalog. Here content providers have a direct role and voice in meeting social needs. In this alternative future the civic institution, here being the White House, instead of the market itself acts as the fulcrum and the partner forger, the power compelling the development of this scenario. A future with more underprivileged youth gaining access to connected devices. A scenario providing ebooks requires e-reader devices and internet connectivity, pushing organizations and programs that provide wider access to these elements including government programs such as the ConnectEd Initiative. This scanning hit can be seen in conjunction with parallel signals that include libraries lending out WiFi hotspots, distributed city WiFi in education settings and roving such as with WiFi in some Uber cars or via blimps and drones from technology players Google and Facebook. Business model shifts. This future empowers publishers pivoting their models as access to some reader groups itself becomes PR and a way to engage and solidify longterm readers. A great opportunity as we see how ebook subscription services including Oyster, Scribd, and 24Symbols are impacted and respond. The new partnerships for closing those access gaps will make for stronger content stakeholders. White House’s CTO Megan Smith expresses that libraries as third place can provide the internet and possibly device access. This puts pressure on internet providers and telecoms as free educational internet-providing players receive focus and appreciation for connecting these young Americans. Increased content consumption means increased data use providing opportunities as well as new partnership directions as internet provision is met by civic-oriented projects and startups. It will also be worth watching stakeholders such as authors and device manufactures. If stakeholders inspired by the opportunities of this program engage the potential we can enter a new era of serving and connecting the next groups of readers and learners. This is an opportunity that start-ups may also begin leveraging. There is now a pathway for using government or civil bodies as the fulcrum point to provide a social betterment service or product via partnerships between the public sector for development and distribution and private for-profit publishers. This raises literacy, information access levels, and customer bases while spreading the development points. The future is partnership driven, co-created, and leverages social betterment and long term growth with economic partner considerations. As a librarian this direction provides hope in new roles for our valuable institutions. As a futurist I see an inspiring outlook for our society. Not something we always get to say. 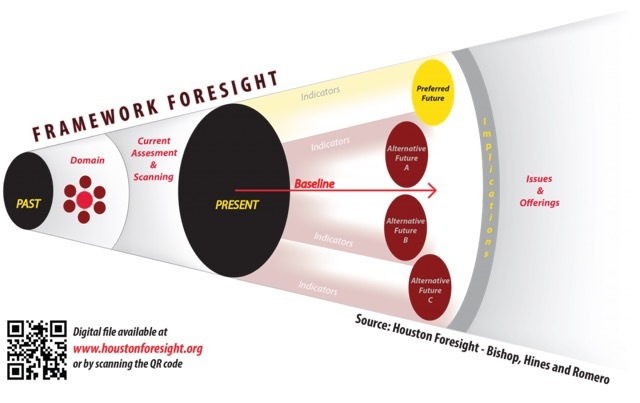 Student – Master of Science in Foresight University of Houston. World Futures course.